Either shake all the ingredients together in a screw-topped jar or mix them individually as follows. Stir the shallots or scallions together with the mustard and salt. Whisk in the lemon juice and vinegar, and when well blended start whisking in the oil by droplets to form a smooth emulsion. Beat in freshly ground pepper. 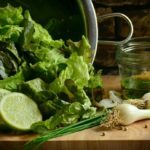 Taste by dipping a piece of the salad greens into the sauce and correct seasoning with salt, pepper and/or drops of lemon juice. Vinaigrette is always at its freshest and best when served promptly, but you can store it in an airtight container and refrigerate for several days. The shallots and fresh lemon juice will eventually go off, spoiling the taste of the dressing. *Add minced fresh herbs to dressing as desired after all the oil has been added. A true French salad is simply mixed greens with vinaigrette such as this. It helps to cleanse the palate between courses. Less than two weeks out from Christmas, and I have yet to buy any presents. My priority was figuring out how to use those beans. If you recall from last week’s blog, I had a few unruly items running amuck in my pantry that were barely out of date for best flavor and taste. Two cans of beans–Garbanzos and Great Northern–were on the list. Should you happen to discover cans of beans hiding somewhere in your kitchen, here are some ideas for you, along with a recipe for Tuscan White Bean Salad. This is a copycat recipe from Houlihan’s that I found on Pub Chain Restaurant Copycat Recipes. If you are looking for a favorite recipe to recreate, this is a good site to check out. That being said, I changed the copycat recipe to suit my tastes. I encourage you to do the same. Nothing really bad will happen when you stray from the original recipe a little. For example, if you don’t have a red onion, use whatever onion you have, or a few sprinkles of onion powder. The red onion looks pretty and has a little different flavor than other varieties, which is why it works well. Oh, and Mr. Non-Compliant missed out on this dish, which I’m sure will make him very sad. *Make hummus by mixing a can of garbanzo beans (drained and rinsed) in a food processor or blender with ¼ cup extra virgin olive oil, 2 Tbsp. lemon juice, 1 clove crushed garlic, 1 tsp. ground cumin, ½ tsp. salt. Add a tablespoonful or two of water if needed to make it the right consistency. Blend until smooth. Adjust seasonings to your taste. *Make white bean and chicken chili for a change from traditional. *There are LOTS of recipes for beans. I’m stopping with the salad recipe so I can go buy some presents! Place ingredients in a bowl and toss with the dressing. Once dressing is blended, add to the salad and lightly toss. Serve with your favorite crackers or toasted, crusty bread. Perfect as a light lunch or dinner. This simple salad would be a nice addition to a holiday buffet, since it offers some nutritional value, which is often missing from those amazing Christmas cookies! Combine ingredients in a bowl. Add dressing and stir to coat well. Serve on a bed of greens or in a lettuce wrap. Combine ingredients in a blender until smooth. Add to chicken or tuna salad. If dressing is not creamy enough, add a bit more olive oil to make it the right consistency. This dressing is versatile and could be used on greens or as a vegetable dip. Finely chop romaine, bell pepper, tomatoes, and green onions. Place all ingredients in a large bowl and stir to combine. Toss with desired dressing. Puree all ingredients in a food processor/blender until smooth. Taste and adjust seasonings if necessary.